So the forecast looks to be holding up. The first storm is affecting the Sierra now and will continue into tomorrow afternoon. The next storm will begin early Friday morning and last into Saturday afternoon. The second storm takes a more southerly trajectory to help even out snowfall/rain totals between the northern and southern Sierra. So our forecasted snowfall totals will remain the same. 10-18" of snow by tomorrow afternoon with the next storm coming in Friday morning and continuing into Saturday bringing another 16-24" of snow. So the grand total will be 2-3' of fresh powder. And I do mean powder. Temperatures will keep the snow in the middle of the Sierra Cement and Champagne Powder snow spectrum. It will be breezy to windy tomorrow and Friday. So lift slowdowns or closures are possible, but it will be borderline. Temperatures will hover in the 20's much of the time, so find some sheltered spots and enjoy! The pattern stays active into next week, but we'll have to wait a couple more days to see if we get more snow or if it just misses us. Stay tuned to Powdiction here and also on Twitter (@powdiction) and on Facebook. We will keep updating snow totals and the conditions out there. Meanwhile, go out and shred the new powder, but be safe! Continued spring-like conditions will be displayed along the western margin of the Great Basin with a shift occurring midweek to more wintry conditions. Winds and clouds will make corn hunting a bit more challenging Tuesday. Mid to late week appears favorable for several snow events which will bring a welcome refresh of snow and do some nice filling in of the blanks left by the most recent dry spell. Coverage is finally at a level where the skiing should be nearly 'full palette', particularly in the more alpine regions. Snow levels will be low enough to do some proper infilling of important approach regions and with the southerly trend of the primary dynamics, the heart of the Range of Light will get a much-needed spackling. The persistent warm air was harder to overcome than expected, hence the overestimate at mountaintop. Was interesting to watch and perhaps I got a bit over excited. Clearing this morning with moderate west winds tapering this afternoon. Don’t despair just yet Pow seekers. Despite the unseasonably mild temperatures that will persist into Saturday, a sizable cement base will endure from mid-mountain and up (~7500 ft). And Saturday night into Sunday features a promising opportunity for the remaining snowpack to receive a nice white topcoat. Late Saturday into Sunday a moderate snowfall is expected to blanket the northern Sierra, as an amplifying trough drops out of the Gulf of Alaska, with sufficient cold air, and plows into the Pacific Northwest (~ just south of the WA/OR border). In the immediate wake of this system, a moderate piece of trailing wave energy branches southward into the northern Sierra (Figure 1). At this time, it appears snow levels will drop fast Saturday night to Lake level yielding an estimate of 3-5” near the mountain base, 5-8” at mid-mountain, and 8-12” at the top with some isolated areas receiving 12”+ (Figure 2). Figure 1 illustrating the large wave pushing into the Pacific NW with trailing shortwave energy headed toward the northern Sierra. Figure 2 illustrating expected precipitation amounts from the weekend system. Preceding and accompanying this system, strong jet dynamics aloft and moderate mid-level baroclinicity will tighten the low-level pressure gradient and create strong winds of 40-50 mph sustained with gusts exceeding 70 mph at times near the Crest. Downsloping winds on the leeside could be equally if not more impressive (Figure 3). As the main system works into the Pacific Northwest, the winds will ramp up quickly Saturday morning and rage most of the day prompting impressive leeward lenticulars. Rain showers are expected Saturday evening, but colder air will work in rapidly as the main energy arrives just before midnight (Figure 4). Figure 3 illustrating strong wind speeds along the northern Sierra, near Lake Tahoe, and on the leeward side. Figure 4 illustrating the cold air advection, relative humidity, and tightening pressure gradient just before midnight on Saturday. with the Saturday night event. Although the infusion of the cold air is impressive given the mild state ahead of this system, like the previous storm, this event will have a subtropical connection reducing the fluff factor (Figure 5). Things should taper off quickly Sunday morning perhaps offering a Sunday afternoon for Pow and fresh tracks. Take advantage! Now these are totals for the upper mountain. 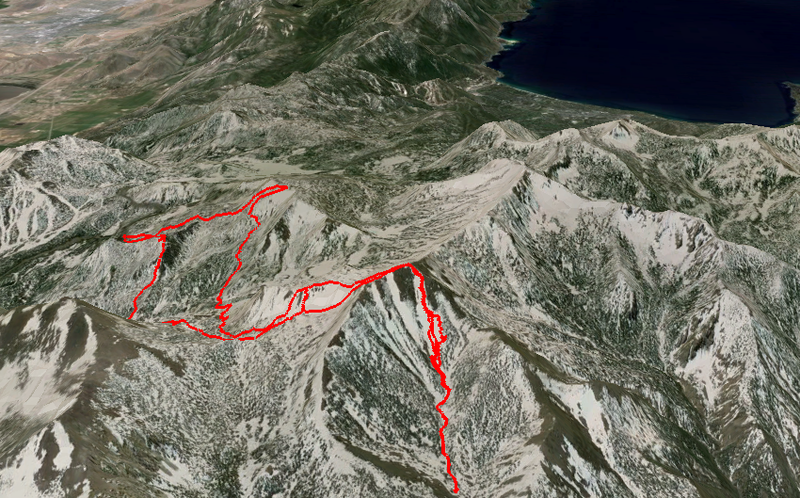 The lower parts of the mountains, with the exception of a few resorts (i.e. Mt. Rose, Kirkwood), received significantly less snowfall accumulation. Overall, the lower parts of the mountains received 1-3' of snow while the upper parts of the mountains received 3-5'+ of snow. So we forecasted the lower to mid mountain amounts pretty well, but under forecasted the upper mountain by about a foot or so. Either way go out and enjoy, but be wary of the conditions. 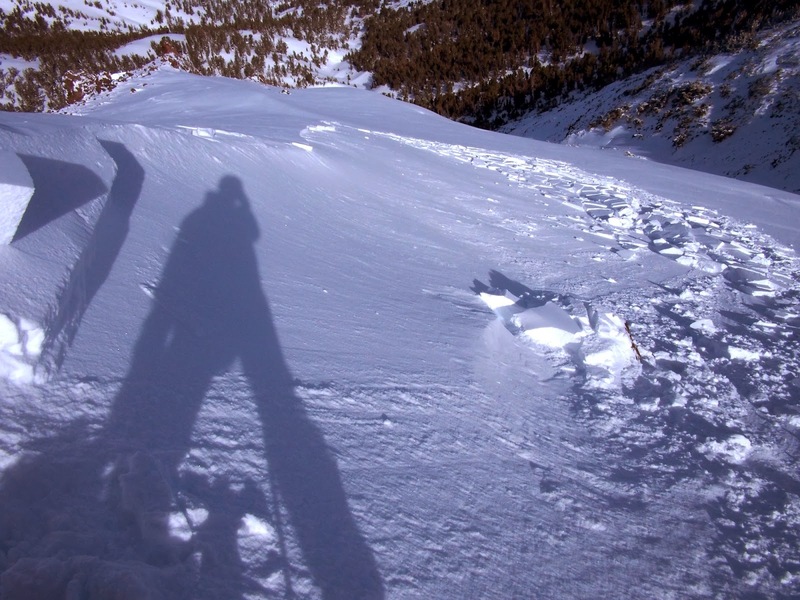 Hatchett will have a post up on the snowpack conditions later. Snow will continue today and taper off tonight. Many lifts are closed due to winds or snow safety concerns, but tomorrow should be a glorious day to ride 2-4'+ of fresh snow. As a reminder areas closer to the crest and at higher elevations will see the most snow! It is still windy, so lift closures and slowdowns will continue. The snow level did increase overnight. It is hovering somewhere between 7-7500 feet right now. It will rise a little more today before dropping tomorrow. We have a new addition to the right-hand-side of the webpage under Pages (just below the Twitter feed). It is our snowfall tracker. This will keep track of all the snowfall we receive, and the amounts we forecasted. This way you can keep up on the season's total and keep us honest. So please take a look and as always, contact us with any questions, suggestions or comments. In the meantime, watch the snow pile up! So the unstoppable force (Pineapple Express/Atmospheric River) is still on track to ram head first into the immovable object (Sierra). Who is going to win? WE ARE! And we are winning with the first proper snow dump on the Sierra for the season (better late than never). So those tricky weather models are trying to keep it colder longer tomorrow and bring the cold air back a little sooner Sunday. They did this right before the last storm and got all of us forecasters to up our totals only to end up with egg on our face. Figure 1: MAJOR rain and snow event coming to the Sierra over the next 3 days. Liquid precipitation totals will range from 4-7+" in the Sierra. And snow, 2-4 feet. With that in mind, here's the update to the forecast. So the pessimistic, probably more practical forecaster in me thinks 6-12" tomorrow, 18-24" Saturday and into Sunday, and 2-4" Sunday night for a grand total of (drum roll).... ~2-3 feet of snow. The optimistic, probably more hopeful forecaster in me is believing the hype and has this breakdown: 12-18" tomorrow, 24-36" Saturday into Sunday, and 3-6" Sunday night for a grand and awesome total of ... 3-5 feet of snow. All in all, I think most areas (above 7500') will see a solid 2-3 feet of snow with the highest elevations pushing 4 feet (Figure 1). The major key is the snow level. The moisture is there. The mountains are here. Instability (upward motion), which helps condense and freeze the water into snow is going to be good enough as well. BUT, and I mean a big BUT, like a Kim Kardashian sized BUT(t), is where the snow level sets up over the next 72 hours. Figure 3 (below): 24-hour liquid precipitation totals valid 10 pm tonight through 10 pm tomorrow. 0.5 to 2" of liquid precipitation expected. Tomorrow morning to tomorrow evening the snow level will be 5-6000' (Figure 2). Models are forecasting 0.5-2" of liquid precipitation, which we think will end up as about a foot of snow give or take a few inches above the snow level (Figure 3). The snow level then increases to 7-8000' Friday night to Sunday evening (Figure 4). This is when it really dumps. Models are predicting 2.5-5" of liquid precipitation, which we think will be 2-3' of snow give or take a handful of inches above the snow level (Figure 5). Finally, the snow level drops again to 6-7000' Sunday night and into Monday morning. Models are forecasting about 0.25-.50" of liquid precipitation, which we think will be 2-6" of snow above the snow level. The winds will be strong through the weekend so expect some lift closures or at least slowdowns (Figures 2 and 4). Also, with all the new snow and the variation in the snowpack, I expect some runs not to be open due to avalanche concerns. Hatchett, will get a post up after the storm to discuss the avalanche concerns from this storm. We will keep updating here, on Twitter (@powdiction), and on Facebook through the weekend and into next week. Like I said, wax those skis and boards, and do not forget to call in sick Monday because it will be the best riding of the year! Another Pineapple Express is on its way to the Sierra! But first we have a colder albeit drier storm coming through late tonight and through tomorrow. So now we have two storms! The mega ridge of death is slowly dying after its mid winter peak and giving way to the more progressive late winter and spring pattern. Figure 1 (top): 9-1000' temperature, wind, and height valid Thursday evening. 1st storm is colder with snow level down to around 5000'. Figure 2 (bottom): 24-hour liquid precipitation forecast valid Wednesday night through Thursday night. Over 0.5" expected along the crest near Tahoe with higher amounts to the south and north. I know everyone wants the snowfall (rain?) totals for these storms, so let's get right to it. The first storm will drop about 4-8" of powder, possibly hitting double digits at the highest elevations around Tahoe with higher amounts to the north (Cascades) and to the south (southern Sierra) (Figures 1-2). The 2nd storm is a doozy. It is forecasted to dump upwards of 8" of liquid water in the northern Sierra and widespread values of 4-6" of liquid water to the rest of the Sierra Friday night through Monday morning (Figure 3). Figure 3: HPC QPF (precipitation forecast) for the next 5 days. Lots of precipitation is coming to the West Coast this weekend. Expecting 5"+ along crest of the Sierra through the weekend. HOWEVER, it comes with a caveat. Snow levels will be high and stay high. Right now the best case scenario is if the snow level sets up at 7000', worst case is at 8500', and most likely scenario is at 7500-8000' (Figure 4). Either way, snow to water ratios will be low (5-8 range). We are forecasting about 2' of snow above 8000' with a range of 18-30" due to the uncertain, but probably high snow level. The 7-8000' level is the tough forecast since we are confident it will be mostly rain below 7000'. The 7-8000' level could be split and range from almost no snow accumulation to more than a foot. We will keep an eye on this. Figure 4: 9-1000' temperature, wind, and height valid Saturday afternoon. Snow levels forecasted to be at ~7500'. So for those who like to listen to us detail why this is happening, keep reading and hopefully learn something. The upper level jet will be over the area for the next few days (Figure 5). It will always not be favorable for upper level lifting to support the snowmaking process, but usually the jet over us is a good sign for snow. This also means it will be windy most of the weekend so we could see some lift slowdowns or closures. Figure 5: Upper level winds and heights. Upper level jet over the area which means strong winds at times through the weekend. The pattern change is similar to the last storm. An upper level trough pushes west due to cold arctic air and there is an approaching trough in the central/eastern Pacific. These troughs help breakdown and split the ridge, but this time it occurs further west. The ridge then builds back and moves east slightly, putting the juicy, moisture rich southwest flow right over us. So this time we will start out cooler with the first storm. 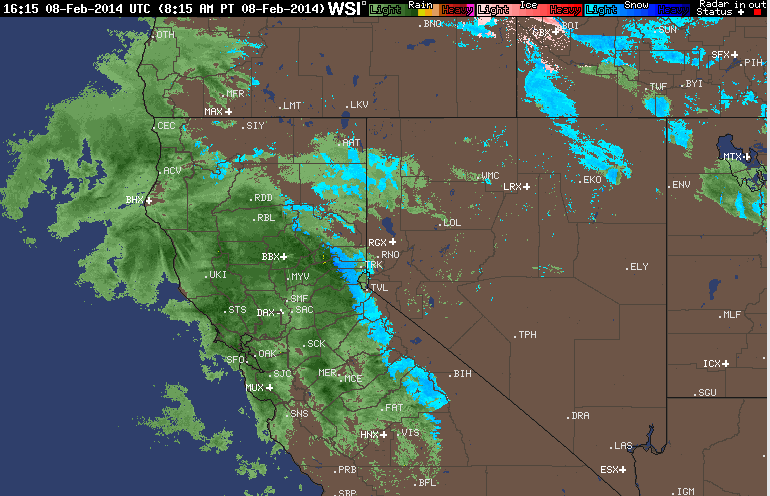 This storm essentially splits and misses the central Sierra. A center of vorticity (measure of spin in the atmosphere, good proxy for small troughs in the flow and instability) moves to our south in northwest upper level flow while the main trough impacts the Cascades (Figure 6). This is the storm that will provide the initial snow. Figure 6: Mid-level heights, winds, and vorticity (shaded). Area of vorticity oriented NW/SE over west coast split from the trough to the north. This split minimized the snow for Tahoe area but to the north and south will see better snowfall totals. We get a quick reprieve Thursday night through early Friday morning before the unstoppable force (Pineapple Express) meets the immovable object (Sierra) and starts dumping lots of precipitation on the Sierra (Figure 7). The heaviest precipitation looks to be late Friday night through Sunday. We get warm air advection (warm air moving in) at lower levels and essentially neutral temperature change at mid and upper levels, which means we should have some decent upward motion in addition to the terrain lifting. This is because colder air over warmer air, means the air below can continue to rise (warm air rises), which helps us make more snow. Figure 7: Precipitable water (measure of total liquid water in atmosphere). Lots of water is coming, some in the form of rain and some in the form of snow. Let's hope for more of the latter for the Sierra. This storm is very wet, which also keeps it relatively warm in the absence of a large, cold trough. The thermodynamic properties (condensation=heat) will keep the snow levels higher. Also, just the sheer amount of moisture will raise dewpoints (temperature of condensation), which will act as a barrier to drop the snow level. Unfortunately, the air temperature cannot be lower than the dewpoint temperature and with dewpoints in the upper 20s to mid 30s in the Sierra, there will be rain. So all in all we have to be mostly happy with the snow and moisture (we need it, DROUGHT) we are going to receive. However, if we get 5" of rain with the snow level staying around 8000', that could spell disaster for mid to lower mountain snowpack. If we had more snow, there would probably be more concern about a rain on snow flood event. However, we don't have that much, but isolated flooding could be a possibility. So go out and enjoy some snow (and rain...sigh) this weekend. Be sure to wax those skis and boards because it will be some sticky Pineapple Pow. Keep thizz rain dancin', and hopefully the Sierra will be looking quite white by early next week. Pineapple pow at its finest courtesy of the subtropical connection; we might FINALLY be able to count in the snow sports enthusiast's favorite unit: the YARD! Snow levels will be in the neighborhood of 7-8k, which is ideal given the need for serious snowpack above 8k. I know, I know, the Fingers are at 7 and we're all jonesing to throw some tricks off the spines and get Sluffaluffagus McBoosterson through the radness, but for all intents and purposes, this is awesome for our general shredding and overall hydrological situations. Keep reducing your water usage nonetheless! The upside-down nature of the wave train will mean extra caution for those wandering in the woods as warming trends coupled with stackin precip means decreasing stability. That said, some cold snow will make for a fun Thursday and Friday and then it will be time to pick up some elevation and grab the slarving stick(s) for a tropical celebration. Put out your meter sticks today, and if all goes as hoped you won't be finding them in a few days! Snow should begin in the Sierra early Thursday morning with mild accumulations making for enjoyable sliding conditions. Snow levels will rise through the weekend to the neighborhood of 8000ft and precipitation rates will increase as subtropical moisture is delivered to the region. This will be extremely favorable for further burial of surficial geology (sharks) and opening the possibility to ride some proper terrain along the crest, especially in the northern and central portions of the range. 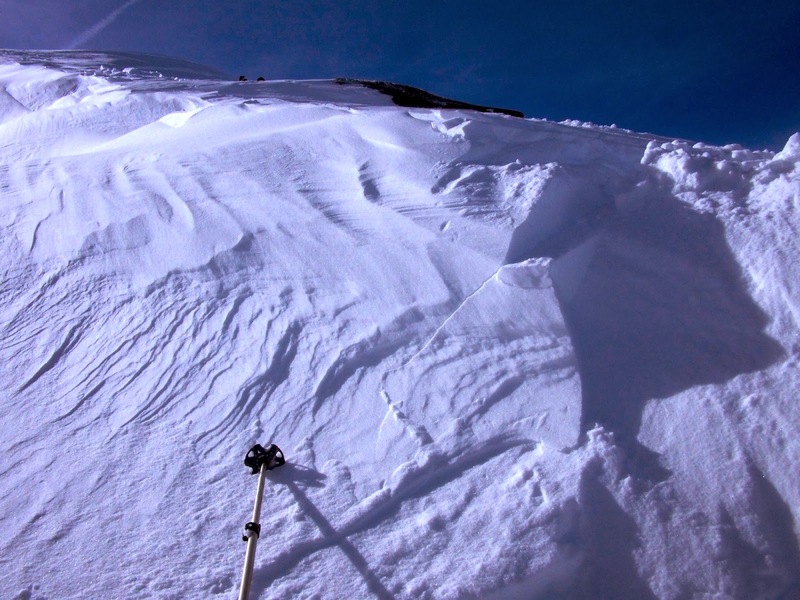 Couloirs and exposed steeps with no fall zones oh please oh please oh please! More snow means bigger and more tabletops, too! Woohoo! All good things. Shasta should benefit from the northerly trajectory which is good for everyone's May and June. Winds will be moderate by normal standards so lift closures should be minimal. Bring your GoreTex (or whatever) and extra pairs of gloves and goggles and go have fun!